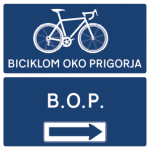 By Bicycle around Prigorje is a circular route that passes through interesting parts of the surroundings of Križevci and Kalničko Prigorje. The entire route is demanding and recommended for bicyclists who are in condition. For everyone else there are several alternative return routes. The route begins in the centre of Križevci, passes through the Upper Town and turns right next to the cemetery in the direction of Apatovac. It passes through Ivanac Križevački and Glogovnica, where the late Gothic Church of the Assumption of the Virgin Mary dominates the beautiful landscape. In Marinovac the route turns left toward Osijek Vojakovački, an agricultural town with the Church of St. Nicholas on its higher ground. At the foot of the hill is a vuglenica, an oven for making wood coal and where you can see it being made in a traditional manner. The route continues toward Vratno, in a picturesque passage in the eastern part of Kalnik. After turning left toward Kalnik, at the bottom of a hill before a rise, there is a spring with water that is supplied to Križevci and its environs. After a three-kilometre grade, you will come to the centre of Kalnik. The main route continues toward Obreški klijet, while the right branch of the route from Kalnik leads to the remains of the old town of Veliki Kalnik and the mountain cabin. The route passes through the street of the old winemaker’s cottage, locally known as “Ilica,” and in Vukovac it joins the main road toward Gornja Rijeka. Via the valley of the Reka Creek, the route leads through Donja Rijeka, Barlabaševec, and Lukačevec to Miholec, where it turns right toward Brežani and Ravenska Kapela, a lake that is known as the gathering place of hunters and fishermen. Following the Črnec Creek, the route leads to Dubovac and Veliki Raven, where next to the Church of St. Ladislav it turns right toward Mali Raven, Špiranec and Prikraj to complete the circle by returning next to the railway station in Križevci and to the town centre.